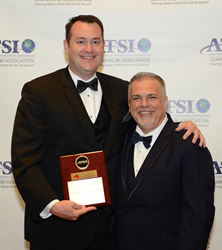 Ambs Call Center, Inc. is proud to announce that their team has been honored with the exclusive ATSI 2018 Award of Excellence. Ambs Call Center, Inc. is proud to announce that their team has been honored with the exclusive ATSI 2018 Award of Excellence. The annual award is presented by the Association of TeleService Internal (ATSI), the Trade Association of telecommunications, call center services, and answering service across North America and the UK. This awards marks the 15th time Ambs Call Center has been recognized by the ATSI for their dedication to excellence in service, with this award being the 8th consecutive year. The award started 22 years ago as a means to improve the overall quality of the call center industry by setting expectations and measurements to ensure a successful call handling experience. Now a 15-time winner, Ambs Call Center, Inc. earned the Ruby Award. About Ambs Call Center, Inc.
Ambs Call Center was established in 1932 and has grown to become a provider of the latest telecommunications technologies to a wide range of industries throughout the nation. With locations in Jackson, MI, Grand Rapids, MI, and Tampa, FL, Ambs Call Center helps businesses become more efficient and profitable with its 24-hour call center services.